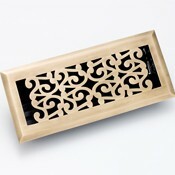 This Zoroufy classic antique black floor registers has a slight hump on the register cover. This is often called a convex style register. Zoroufy classic convex design, antique brass floor registers will give an added touch of class to your floors. Hard to find pewter registers! Zoroufy classic convex design, antique pewter floor registers are an easy to install, drop-in style register. These are Zoroufy classic hump designed, polished brass floor registers with a clear lacquer coat to help resist tarnishing.